In fact, why don't you take your pick from a wide selection of old supermarket baskets here at the PTA Thrift Shop at 125 W Main St, Carrboro, NC? Actually, these generally look pretty recent, with the possible exception of the light blue Mutual Drug basket in the left stack. Thrift stores are often a great place to find old supermarket items like baskets or carts. And practically-new Joseph A. Bank suits for $8 (or maybe I just get lucky!). Imagine this: a former Advance Auto Parts store is turned into a supermarket. 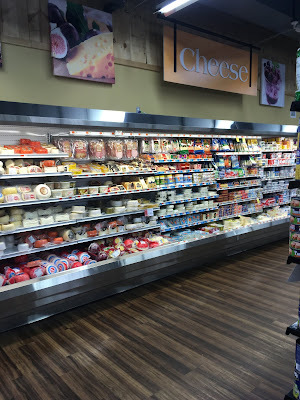 A supermarket with fresh produce, meats, an in-store butcher, a service seafood counter, a deli that also makes sandwiches, an in-store bakery, a salad bar, a hot food bar, a soup bar, dairy, and frozen foods. Plus organic produce, Portuguese foods, Latin foods, eastern Asian foods, and an in-store café. In 12,000 square feet. In a city that's never had a full-size supermarket since its founding. No, it's not too good to be true. It's just the Seabra Foods in Harrison. This store, which opened in 2016, is all of that. 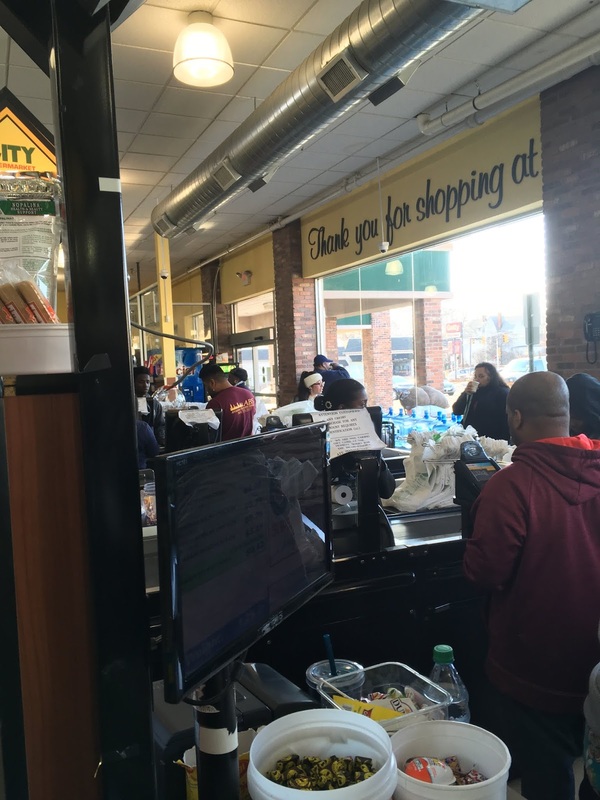 Located in the quickly-developing New York City suburb of Harrison, this store is catering largely to the commuter crowd. 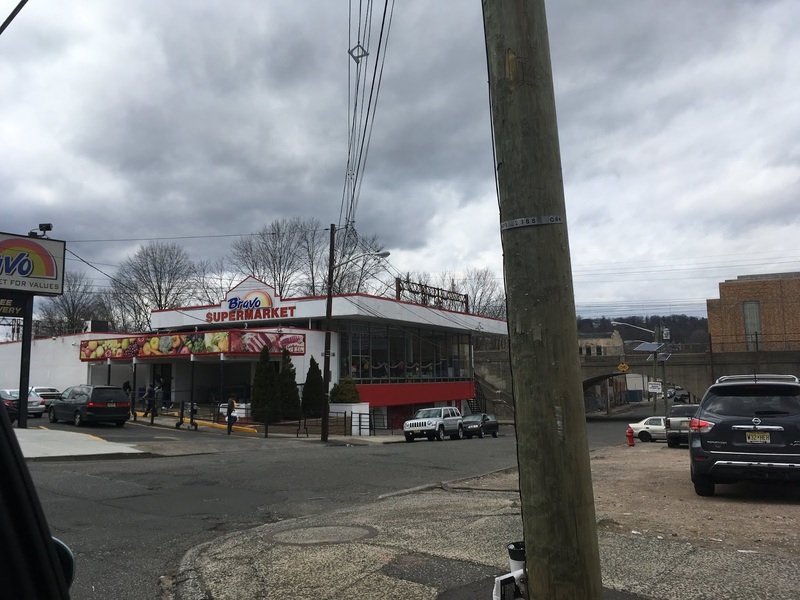 As discussed before, there are two branches of the Seabra family, one of which owns Seabra Foods; the other owns Seabra's Market (formerly A Seabra Foods). The entrance is on the right side of the store, leading into a produce department along the right-side wall. Meat, seafood, and bakery run along the back wall counterclockwise, with hot foods and salad in the far back corner and deli/café in the front corner. Notice that there are even (real) wood picnic tables along the front for nice weather. The entrance brings you into the small produce department. (Sorry about the picture.) It's set up as a double-wide aisle with the customer service counter just next to the entrance. Dairy and cheese are located in the back corner of the first aisle. Because the store was not previously a supermarket, all the fixtures (as well as the floor) are brand new. Meat and a tiny service seafood counter, added after I took these pictures, run along the back wall. The grocery selection is very complete for such a tiny store. It's unusual to see a Portuguese/Latin store like Seabra carrying such a substantial Asian selection, but it reflects the local population. Here you can see the café along the front wall. Although the store is so small, it's very spacious. The registers, for instance, are smaller than the typical supermarket register, allowing the front-end to be narrower. A look at the deli/bakery section in the last aisle. This area has been rearranged with a larger hot food bar, a salad and olive bar, and a soup bar in place of these coffin cases. 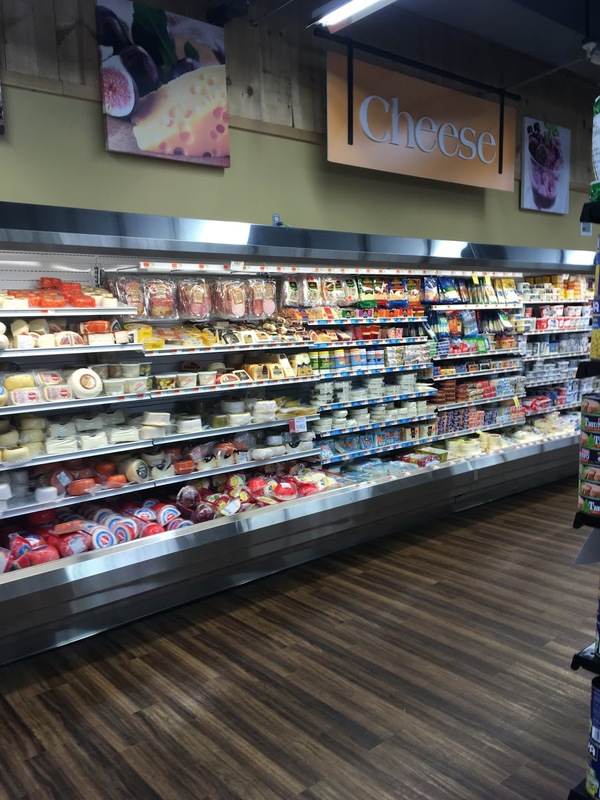 The packaged bread selection has been downsized to a smaller case in the middle here and the facing aisle now has cold drinks, prepared salads, and specialty cheeses, in higher demand here than commercially-baked breads. The above photo reflects the old arrangement. The frozen selection has also been downsized, again in favor of prepared and specialty foods. The front wall is to the left in the above picture. Notice all the space around each case. You'd never know from these pictures how small the store is! The hot foods are delicious, as are the baked goods. However, a word of warning: because the store is so upscale, grocery items are quite expensive. The Market Report is starting soon with a brand-new group of stores in southwestern Brooklyn! Posts begin on Monday, November 12th, 2018 with a store tour. Each yellow marker represents a store, and the ones with numbers on them represent that number of stores (too close together to put multiple markers). 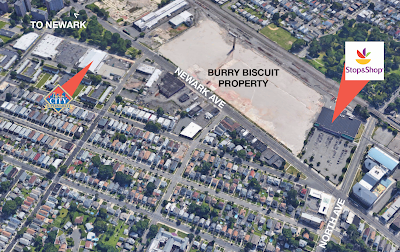 We're going to start on the north end with Food Universe Marketplace at 4118 3rd Ave, Brooklyn, NY and work our way down. My pictures came from my visit to the area in February 2018. 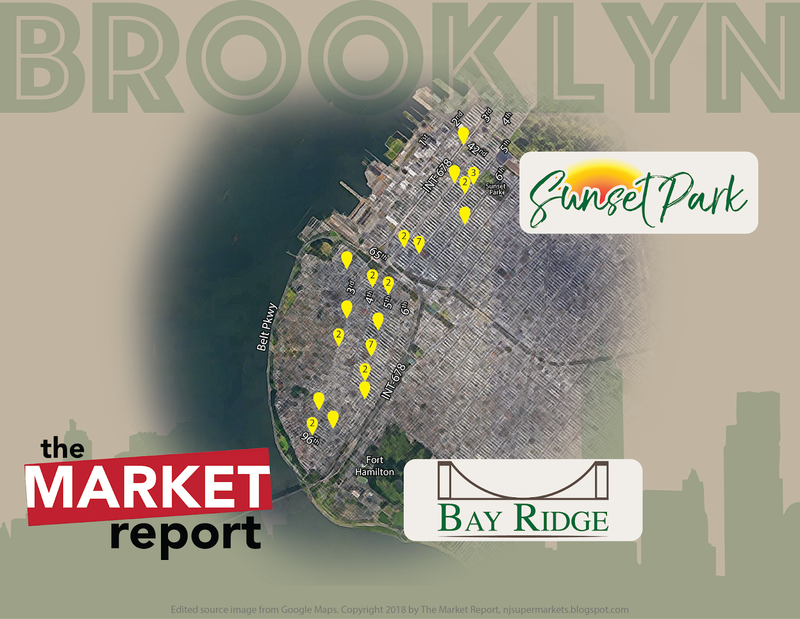 Sunset Park is a highly diverse, middle-class section that has areas of residential neighborhoods, vibrant and bustling business districts, and industrial stretches. Generally, the industry is closest to the water, moving to business districts on 4th and 5th Avenues, becoming largely residential by 6th Avenue. 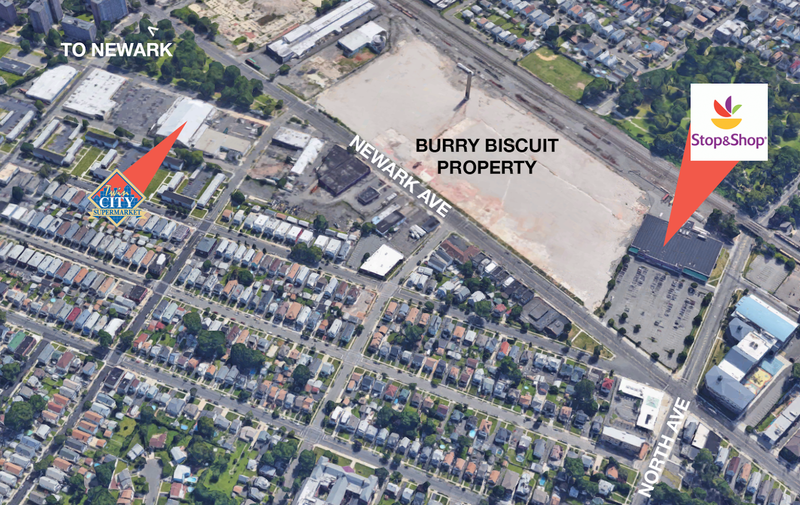 Just to the northeast of Sunset Park is the enormous Greenwood Cemetery, with the smaller but equally green Sunset Park (after which the neighborhood is named) a few blocks south. Sunset Park is incredibly diverse, with its population being 43% white and non-white Hispanic, 36% white, 29% Asian, and 25% other ethnicities. Bay Ridge, on the other hand, is a much more traditional, quiet, and suburban (in some places) neighborhood. With a population made primarily up of families and that is 66% white, it's a slower-paced neighborhood. However, Bay Ridge does also have significant Hispanic and Middle Eastern populations, especially towards the eastern side. 5th Avenue is a major business center for the Middle Eastern community, while 4th Avenue and west is a primarily white area. 3rd Ave is also a major business district with trendier businesses such as Starbucks and many restaurants. West of 3rd Avenue is largely residential. Regular posting will continue this week, including a store tour tomorrow, and we'll have another store tour next Monday, and memorabilia on Tuesday and Wednesday. Plus, come back on Thursday for a historical photo recently submitted to The Market Report and on Friday for a special video feature! We're back in North Carolina for one more Snapshot today. 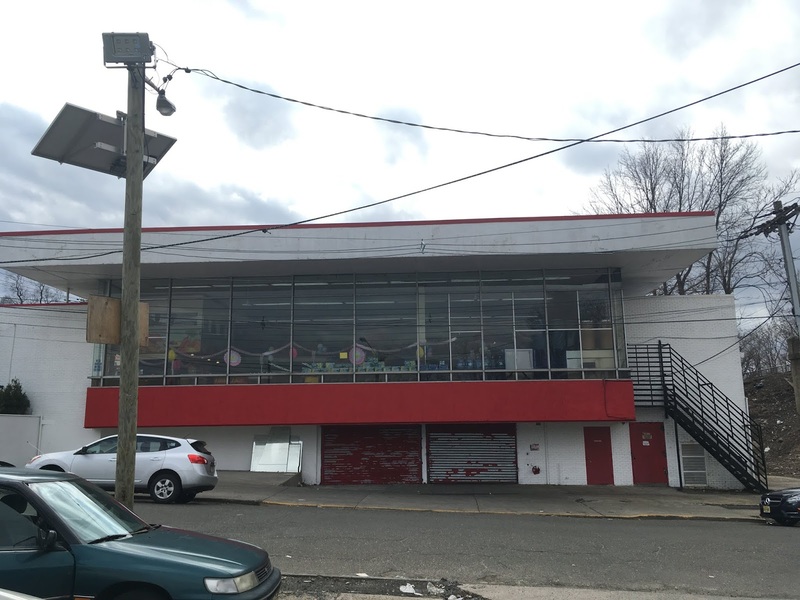 The Little Burma Asian Market, as seen above, is located at 110 W Main St, Carrboro, NC. A Google review notes that, although the store is small, it carries "a large variety of Asian seafood, veggies/legumes, spices, beverages, candies, noodles, and other staples". We saw a full tour of the Bravo Supermarket in Orange, NJ back in July. However, my only exterior photos were nighttime pictures. So here's some daytime ones. Overview of the front of the store from Scotland Rd. A look at the all-glass front wall of the store from the overflow parking lot across the street. A few delivery trucks were also parked in the lot across the street, including an old CTown van and this refrigerator truck with an address in Hollywood, FL on the side. The address printed on the side is a residential development, so it's possible I'm reading the address wrong. But it's also possible that this Bravo owner (Nick Gonzalez) also owns one or more Bravo stores in Florida. Monsey, NY is part of the town of Ramapo, New York. 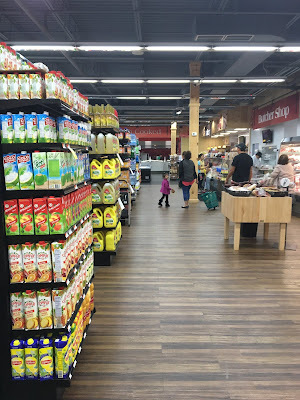 It's home to one of the largest Orthodox Jewish communities in the area, and therefore is home to several Kosher supermarkets. 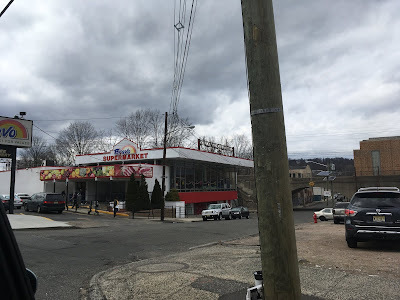 One such example is Evergreen Supermarket, located at 59 NY-59 in Monsey. The company has a second location in Lakewood, NJ. This store looks like one of the more upscale Kosher supermarkets, and it's supplied in part by White Plains, NY-based Krasdale Foods. Diagonally across the street from the awesome Twin City Supermarket in Elizabeth, NJ is a Stop & Shop as bland and boring as they come. Twin City has so much more personality, and history -- and selection of ethnic and specialty foods. I initially showed this graphic on the tour of Twin City, but I'm repeating it here to show what we're looking at today. As I said in the initial caption to this map, the Stop & Shop was built as an Edwards Super Food Store in the 1990s, then Stop & Shop opened in the early 2000s. 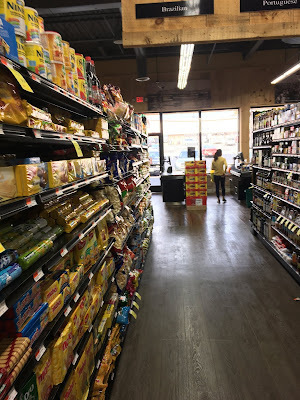 I think the treatment of the stores reflects what they deserve -- Twin City gets a full tour with lots of photos, Stop & Shop gets a few drive-by photos that are either blurry or blocked by a bunch of telephone poles. Fair enough. This store, located at 801 Newark Ave, is huge, cavernous, and deadly boring. At least the prices are low. This store immediately borders the vacant Burry Biscuits property. We're heading over to Irvington, NJ, a small city in Essex County that also has one of the highest crime rates in the state. Contrary to what you might think, this has not deterred supermarket owners from investing in the township. Supremo opened a store in Irvington around 2005, while City here opened in 2010 under the Super Fine Fare banner, switching two years later. And most recently, James Lee's SuperFresh opened in the former Pathmark in the summer of 2016. This particular property has a long history as a supermarket. 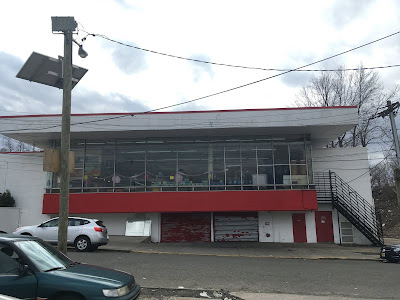 Sam Aidekman had operated a Good Deal Supermarket here beginning in the 1960s, and when Good Deal sold to a ShopRite operator in 1976, it's possible this store became a ShopRite briefly. It was definitely later a Mayfair Foodtown before closing in the 1990s. A short-lived C-Town operated here about 2000-2005, and is visible closed in the 2007 Google Maps street view of the property. City Supermarkets looks to be very successful five years after it opened, and they certainly have a beautiful facility. The switch from C-Town to Super Fine Fare involved a complete gut of the entire building, a new facade, and new decor inside. You can read more about City Supermarkets here, and see a tour of their Newark location here. You can see even the windows to the left have been replaced. In the past, supermarket owners would never put such large windows in a high-crime area, fearing break-ins. But times have changed. A prime example of the older design can be seen at the Compare Foods in Hartford, CT. Anyway, back to Irvington. You enter to the right and exit to the left. The entrance takes you into the produce aisle, which runs along the right side of the store. Seafood is located at the back of the first aisle, with meats along the back wall. Dairy is in the last aisle and deli is along the front-end at the far side. Great first impression. The store's produce department is large, clean, and well-stocked. Prices and quality were very good when I visited. You can begin to see along the front-end from the produce aisle here. The customer service counter is just in front of the clear panels, with sale items to the left near the entrance. This decor package, which is quite impressive with a high ceiling like in Newark, also works on a scaled-down level with a lower ceiling. Seafood comes next along the perimeter, with a combination of fillets of fish and whole fish. The butcher shop (uh, I mean, the butcher shoppe) is the next stoppe -- sorry, I mean stop -- along the perimeter. The fixtures were all installed when the store opened in 2010. Packaged meats continue along the back wall. The shelves are well-stocked with a very good variety of products. However, the variety of each item is not very wide (because the store is small), so they might only have one brand or one size of each. 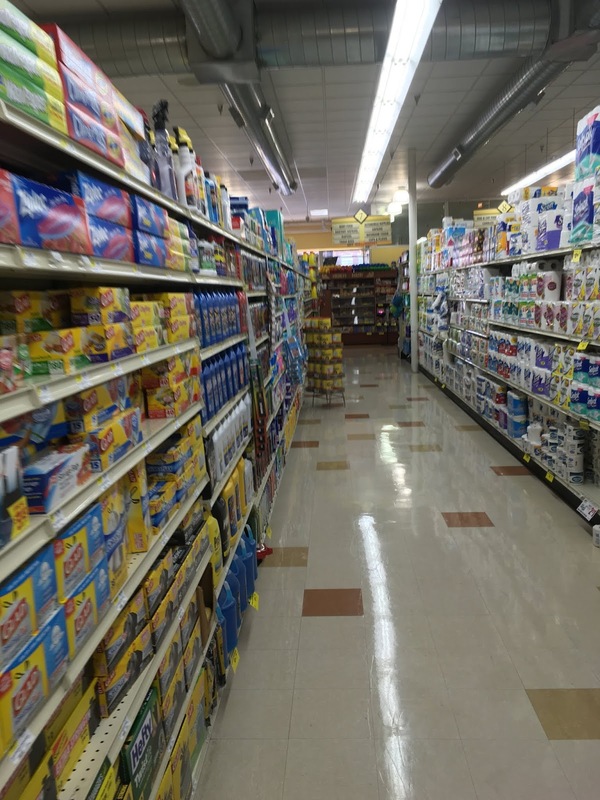 The aisles are spotlessly clean and pleasantly clutter-free. If you zoom in here, you can see they didn't quite catch this Fine Fare logo on the aisle marker. Although City Supermarkets decals were put over most of the Fine Fare logos, some aisle markers remain Fine Fare-labeled -- or Fine Fare on one side and City on the other. The exposed ductwork and brick, which we'll see shortly, are features typically seen in much cooler or trendier (i.e. more expensive) stores. They're a nice touch in this supermarket. Notice that this aisle marker has been redone to show the City logo. A look along the back wall towards seafood. A look down the last aisle with dairy on the perimeter wall. Again, the decor is very attractive here. However, notice that each department is not painted a separate color as they are in Newark; the whole store is done in yellow. We also don't typically see these hanging pendant lights below a drop ceiling. The store tops out at 10 aisles, putting it in the 30,000 square foot range or so. The deli is at the front of the dairy aisle (behind me in the above photo). And there it is, The Deli! 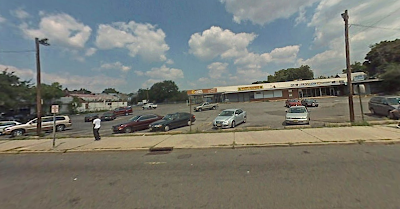 Unlike Newark, this store doesn't really have a bakery department, although there are some baked goods near the deli and in front of the managers' offices, visible to the left here. The front-end continues to the left. Also notice the exposed brick column in the corner, which is a nice touch. Fresh bread and some cookies and other baked goods are sold from the wood-style cases here. As you can see, the deli is somewhat hidden from the rest of the store, so the designers thought it would be necessary to add this hard-to-miss deli sign! The front-end continues past the bread cases. The huge windows let in a lot of light, making the front-end very bright. More brick columns line the front wall. Once again, the design of the store makes it look much more upscale. It's a nice touch for a store that does have great prices. Let's head outside before we leave City for a minute. Yes, three tenants after Foodtown left, the sign on Stuyvesant Ave still proudly displays the Foodtown logo! C-Town, Fine Fare, and City all have left it. As much as I'd like to see this end of the property fixed up a little, it's still cool to see this original sign still intact probably 20+ years after Mayfair closed!